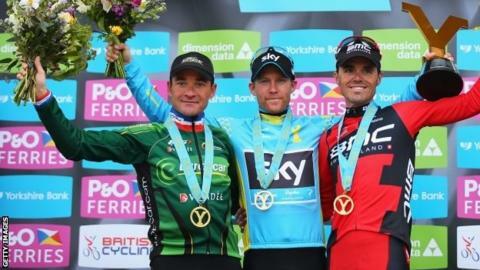 Norwegian Lars Petter Nordhaug clinched the overall victory for Team Sky in the inaugural Tour de Yorkshire. The 30-year-old finished safely to take the win by 11 seconds from Samuel Sanchez and Thomas Voeckler. The final stage was won by BMC's Ben Hermans who claimed a great solo win after a demanding 167km, which included six climbs from Wakefield to Leeds. Nordhaug, who became Team Sky's leader after Ben Swift crashed out, was sixth over the line on Sunday. Sanchez attacked 37.5km from the end but Nordhaug responded to pip the Spaniard to the single remaining bonus second in the final intermediate sprint and crossed the line on Sanchez's wheel to seal his Tour win. Thousands of fans lined the route, as they had done the previous two days, and glimpsed British Tour de France winner Sir Bradley Wiggins, who finished in the peloton, five minutes behind the winner. The top British rider overall was Erick Rowsell, younger brother of Olympic champion Joanne, who came eighth, 1min 21secs behind winner Nordhaug.